For departmental libraries, academics, and students in linguistics departments, and in neighbouring disciplines such as applied linguistics and education; anthropology; English language; literary studies; gender studies; sociology; and social psychology. /inca/publications/misc/622026mesthrie.pdfA full listing of the contents, including page numbers is also available. Foundations of Society and Language. Anthropological linguistics (E. Keating). Attitudes and behavior (W.S. Bainbridge). Bilingualism, individual (F. Grosjean). Bilingualism, societal (M.H.A. Blanc). Communication (K.L. Berge). Communicative competence (A. Duranti). Ecology of language (J.M.Y. Simpson). Language (J.M.Y. Simpson). Language as a social reality (T. Pateman). Language in society: overview (M.L. Apte). Multiculturalism and language (J.R. Edwards). Pragmatics and sociolinguistics (J.L. Mey). Prescriptive and descriptive grammar (C. Cullen). Role theory (R.H. Turner). Sapir-Whorf hypothesis (O. Werner). Saussurean tradition and sociolinguistics (J.E. Joseph). Social psychology (W.S. Bainbridge). Socialization (C.B. Cazden). Sociolinguistics of sign language (C. Lucas). Sociology of language (W.S. Bainbridge). Speech community (B.B. Kachru). Language and Interaction. Antilanguage (P.A. Chilton). Audience design (A. Bell). Conversation analysis (P. Drew). Conversational maxims (J. Thomas). Cooperative principle (J. Thomas). Deaf community: structures and interaction (J.G. Kyle). Dialogism (T.A. Marshall). Discourse (A. Mchoul). Discourse in cross-linguistic and cross-cultural contexts (M. Clyne). Doctor-patient language (M. Lacoste). Ethnography of speaking (G. Philipsen). Ethnomethodology (G. Psathas). Identity and language (R. Mesthrie, A. Tabouret-Keller). Kinesics (A. Kendon). Kinship terminology (E.L. Schusky). Language in the workplace (B. Holmqvist, P.B. Andersen). Narrative, natural (M. Toolan). Phatic communion (D. Abercrombie). Politeness (G. Kasper). Speech accommodation (H. Giles). Speech act theory: overview (K. Allan). Language Variation: Style, Situation, Function. Advertising (M.L. Geis). Blessings (B.G. Szuchewycz). Business language (G. Rasmussen). Code, sociolinguistic (U. Ammon). Context (U.M. Quasthoff). Diglossia (A. Hudson). Discourse analysis and the law (D. Eades). Formulaic language (F. Coulmas). Genre (T. Threadgold). Institutional language (S. Sarangi). Literary language (R. Carter). Media language and communication (K.C. Schrøder). Medical language (J. Maclean, J.C. Maher). Register (W. Downes). Religion and language (J.F.A. Sawyer). Slang: sociology (I.L. Allen). Speech and writing (J.E. Miller). Speech play (M.L. Apte). Style (M. Short). Taboo words (M.L. Apte). The internet and language (C. Thurlow). Verbal duel (R. Ackerman). Language Variation and Change: Dialects and Social Groups. Accent (J.M.Y. Simpson). Adolescent peer group language (R.L. Taylor). Chain shifts (G. Docherty, D. Watt). Class and language (F. Gregersen). Dialect and dialectology (S. Romaine). Dialect humor (M.L. Apte). Ethnicity and the crossing of Boundaries (B. Rampton). Ethnicity and language (E.F. Kotzé). Forensic phonetics and sociolinguistics (P. Foulkes, J.P. French). Gay language (W. Leap). Gender and language (K.M. Mccormick). Language change and language acquisition (E.L. Bavin). Maps: dialect and language (J.M. Kirk). Social class (M.W. Macy). Social networks (A.L. Milroy). Sociolinguistic variation (R. Mesthrie). Sociolinguistics and language change (J. Milroy). Sociophonetics (S. Wright, revised by C.M. Sangster). Sound change (J.J. Ohala). Subcultures and countercultures (R.L. Taylor). Syntactic change (N. Vincent). The atlas of North American English: methods and findings (S. Ash). Urban and rural forms of language (A.M. Hamilton). Vernacular (R. Macaulay). Language Contact. Areal Linguistics (J.M.Y. Simpson). Bilingualism and language acquisition (C. Letts). Borrowing (J. Heath). Code-mixing (R. Mesthrie). Code-switching: discourse models (P. Auer). Code-switching: overview (K. Mccormick). Code-switching: sociopragmatic models (S. Gross). Code-switching: structural models (R.M. Bhatt). Contact languages (S.G. Thomason). Endangered languages (L.A. Grenoble, L.J. Whaley). English as a foreign language (G. Abbott). Ethnolinguistic vitality (H. Giles). Foreigner talk (M. Clyne). Interlanguage (E. Tarone). Intertwined languages (P.C. Muysken). Jargons (P. Mühlhäusler). Koinés (R. Mesthrie). Language enclaves (K. Mattheier). Language loyalty (R. Mesthrie). Language maintenance, shift, and death (R. Mesthrie). Language spread (R. Mesthrie). Language transfer and substrates (T. Odlin). Lingua franca (M. Barotchi). Migrants and migration (A.M. Pavlinic). Missionaries and language (P. Lewis). Native Speaker (A. Davies). New Englishes (B.B. Kachru). Pidgins and creoles: an overview (L. Todd). Pidgins and creoles: models (J. Aitchison). Pidgins and creoles: morphology (F.C.V. Jones). Sociolinguistic area (J. D'souza). Language, Power and Inequality. Critical language awareness (J.L. Mey). Critical sociolinguistics (G. Kress). Discrimination and minority languages (R. Phillipson, T. Skutnabb-Kangas). Hegemony (G. Mininni). Honorifics (M. Shibatani). Ideology (C. Luke). Language conflict (D.P. Pattanayak). Linguicide (T. Skutnabb-Kangas, R. Phillipson). Linguistic imperialism (R. Phillipson, T. Skutnabb-Kangas). Manipulation (N. Fairclough). Marxist theories of language (G. Mininni). Minority languages (J.M.Y. Simpson). Politicized language (A. Davies). Politics and language (P.A. Chilton). Power and language (N. Fairclough). Power differentials and language (P.L. Van Den Berghe). Representation (R. Fowler). Semilingualism (J. Cummins). Stereotype and social attitudes (M.L. Apte). Symbolic power and language (C. Vigouroux). The linguistic marketplace (I. Gogolin). Language Planning, Policy, Practice. Academies: dictionaries and standards (L.C. Mugglestone). Artificial languages (A. Large). Heritage languages (J. Cummins). International languages (U. Ammon). Language adaptation and modernization (S. Bowerman). Language development (H.R. Dua). Language diffusion policy (C.G. Maclean). Language planning: models (A. Deumert). Linguistic census (L.M. Khubchandani). Linguistic habitus (I. Gogolin). Multilingual States (D.D. Laitin). National language/official language (C.M. Eastman). Nationalism and language (L. Greenfield). Orthography (M. Sebba). Prescription in dictionaries (L.C. Mugglestone). Reversing language shift (J.A. Fishman). School language policies (D.J. Corson). Standardization (E. Haugen). Statistics: principal languages of the world (Unesco). (J.M.Y. Simpson). Verbal hygiene (D. Cameron). Language and Education. Applied linguistics and sociolinguistics (D.R. Preston). Bilingual education (M.E. Brisk). Black English in education: UK (M. Dalphinis). Child language: an overview (S. Strömqvist). Ebonics and African American vernacular English (J. Baugh). Education and language: overview (K. Perera). Educational failure (J.R. Edwards). English grammar in British schools (A.M. Philp). Gender, education, and language (J. Swann). Home language and school language (M. Maclure). Literacy (C.J. Daswani). Oracy (A.M. Wilkinson). Pidgins, creoles and minority dialects in education (J. Siegel). Spoken language in the classroom (N. Mercer). Standard English and education policy (M. Farr, A. Ball). Teaching endangered languages (L. Hinton). Methods in Sociolinguistics. Attitude surveys: question-answer process (H. Schuman). Corpus linguistics and sociolinguistics (M. Sebba, S.D. Fligelstone, revised by W.A. Kretzschmar Jr.). Data collection in linguistics (J. Miller, R. Cann). Field methods: ethnographic (M.L. Apte). Field methods in modern dialect and variation studies (K. Hazen). Fieldwork and field methods (U. Canger). Fieldwork ethics and community responsibility (B. Johnstone). Interactional sociolinguistic research methods (N. Berenz). Literacy: research, measurement, and innovation (D. Wagner). Multidimensional scaling (W.C. Rau). Observer's paradox (A. Davies). Observing and analyzing classroom talk (A.D. Edwards, D.P.G. Westgate). Reliability/validity (E. Babbie). Salvage work (endangered languages) (N. Dorian). Scaling (E. Babbie). Small group research (W.S. Bainbridge). Sociometry (W.S. Bainbridge). Statistics in sociolinguistics (D. Sankoff). The Profession. Institutions and Resources. Endangered language projects (an inventory) (L.A. Grenoble, L.J. Whaley). Internet resources for sociolinguistics (A. Deumert). Professional associations (R. Mesthrie). Sociolinguistics journals: a critical survey (N. Coupland). Profiles of Sociolinguists. Ammon, Ulrich (1943- ) (A. Deumert). Bakhtin, Mikhail M. (1895-1975) (J.M. Weir). Bamgbose, Ayo (1932- ) (R. Mesthrie). Baugh, John (1949- ) (R. Mesthrie). Bernstein, Basil (1924- ) (K. Rajagopalan). Bickerton, Derek (1926- ) (G.G. Gilbert). Blommaert, Jan (1961- ) (K. Maryns). Boas, Franz (1858-1942) (R. Darnell). Bourdieu, Pierre (1930- ) (C. Vigouroux). Bright, William (1928- ) (B.B. Kachru). Cameron, Deborah (1958- ) (S.S. Mcrae). Coates, Jennifer (1942- ) (S.S. Mcrae). Cooper, Robert Leon (1931- ) (B. Spolsky). Cummins, Jim (1949- ) (C. Baker). Das Gupta, Jyotirindra (1933- ) (L.M. Khubchandani). Decamp, David (1927-79) (R. Le Page). Dittmar, Norbert (1943- ) (P. Schlobinski). Dorian, Nancy (1936 - ) (S. Romaine). Edwards, John Robert (1947- ) (W.F. Mackey). Emeneau, Murray Barnson (1904- ) (W. Bright). Fairclough, Norman (1941- ) (H. Janks). Fasold, Ralph W. (1940- ) (W. Wolfram). Ferguson, Charles A. (1921-98) (J.A. Fishman). Firth, J.R. (1890-1960) (F.R. Palmer). Fishman, Joshua A. (1926- ) (B. Spolsky). Foucault, Michel (1926-84) (J.C. Maher). Giles, Howard (J. Bradac). Gilliéron, Jules (1854-1926) (T. Hill). Goffman, Erving (1922-82) (R.L. Schmitt). Görlach, Manfred (1937- ) (E.W. Schneider). Gramsci, Antonio (1891-1937) (N. Helsloot). Grierson, Sir George Abraham (1851-1941) (J.C. Wright). Gumperz, John J. (1922- ) (N. Berenz). Hall, Robert A. Jr. (1911-97) (M. Danesi). Halliday, Michael Alexander Kirkwood (1925- ) (J. Fine). Haugen, Einar (1906-94) (N. Hasselmo). Heath, Shirley Brice (C.B. Cazden). Hesseling, Dirk Christiaan (1859-1941) (G.G. Gilbert). Hill, Jane (1939- ) (V. Santiago-Irizarry). Hymes, Dell Hathaway (1927- ) (N.H. Hornberger). Jaberg, Karl (1877-1959) (T. Hill). Kachru, Braj B. (1932- ) (R. Pandharipande). Khubchandani, Lachman M. (1932- ) (R.K. Agnihotri). Kurath, Hans (1891-1992) (T. Hill). Labov, William (1927- ) (D. Sankoff). Lakoff, Robin Tolmach (J. Bennett). Lambert, Wallace E. (1922- ) (G.R. Tucker). Le Page, Robert (1920- ) (A. Tabouret-Keller). Lewis, E. Glyn (1920-94) (D. Brown). Malinowski, Bronislaw Kaspar (1884-1942) (A.T. Campbell).Mazrui, Ali A. (1933- ) (A.M. Mazrui). Mcdavid, Raven Ioor, Jr. (1911-84) (T. Hill). Milroy, Lesley (1944- ) (Li Wei). Mufwene, Salikoko S. (1947- ) (R. Mesthrie). Mühlhäusler, Peter (1947- ) (P. Baker). Muysken, Pieter Cornelis (1950- ) (A. Bruyn). Myers-Scotton, Carol (S. Gross). Nida, Eugene Albert (1914- ) (R.E. Longacre). Paulston, Christina Bratt (1932- ) (M. Swain). Platt, John T. (M. Görlach). Poplack, Shana (G. Van Herk). Quirk, Professor Sir (Charles) Randolph (1920- ) (J. Roberts). Reinecke, John E. (1904-82) (G.G. Gilbert). Rickford, John Russell (J. Baugh). Romaine, Suzanne (1951- ) (C.M. Sangster). Sacks, Harvey (1935-75) (G. Psathas). Sankoff , Gillian (1943- ) (C. Surek-Clark). Sapir, Edward (1884-1939) (R. Darnell). Saville-Troike, Muriel (R. Pandharipande). Schegloff, Emanuel (J. Heritage). Schiffrin, Deborah (S. Hunt). Schuchardt, Hugo (1842-1927) (G.G. Gilbert). Shuy, Roger W. (1931- ) (J. Kreeft Peyton). Spolsky, Bernard (1932- ) (R. Mesthrie). Srivastava, Ravindra Nath (1936-92) (R.K. Agnihotri). Street, Brian (1943- ) (M. Prinsloo). Tannen, Deborah (J. Bennett). Trudgill, Peter John (1943- ) (P. Kerswill). Tucker, G. Richard (1942- ) (J. Crandall). Valdman, Albert (1931- ) (B. Spolsky). Van Name, Addison (1835-1922) (G.G. Gilbert). Voloshinov, Valentin Nikolavic (1895-1936) (D. Brown). Weinreich, Uriel (1926-67) (T. Hill). Wenker, Georg (1852-1911) (T. Hill). Whorf, Benjamin Lee (1897-1941) (J.H. Stam). Williams, Glyn (1939- ) (D. Brown). Wodak, Ruth (1950- ) (C. Anthonissen). Wolfram, Walt (1941- ) (C.T. Adger). @from:Bill Bright, ex editor, Language in Society @qu:Mesthrie's outline is well thought out, and he is a sound scholar. ... a volume that meets high scholarly standards, and will be of great usefulness to readers seeking a reference book in sociolinguistics. @source: @from:Suzanne Romaine, University of Oxford @qu:From 'accent' to 'vernacular', the Concise Encyclopedia of Sociolinguistics covers key areas of concern in this fascinating and growing field. Mesthrie has assembled a team of leading experts to author entries organized around the main themes of the discipline: Variation and Change, Culture, Power and Ideology, Language Contact, Social Interaction, Research Methods, and Applications of Sociolinguistics. A guide to institutions and resources, including a critical survey of journals and profiles of some of the sociolinguists who have shaped the discipline, rounds out the volume. Beginners and experts alike will find it an indispensable foundation. @source: @from:William Labov, University of Pennsylvania @qu:Here is the broad and comprehensive view of sociolinguistics that will satisfy the most curious and inquiring mind. The technical topics are covered with solid competence, while the general issues are reviewed with a rewarding thoughtfulness. The editor is to be congratulated! @source: @from:Patricia Donaher, Missouri Western State College @qu:My first reaction upon skimming the text was "WOW!," a reaction that has not diminished with further acquaintance¿.. 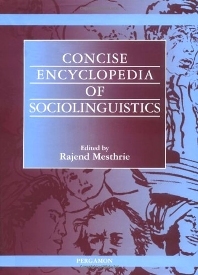 The "Concise Encyclopedia of Sociolinguistics" is an impressive volume and its Editor, Rajend Mesthrie, has provided both the general reader of linguistics and the serious researcher a well written, well researched overview of this subfield of linguistics. Read this review at http://linguistlist.org/issues/13/13-1847.html @source: @from:Lisa DeWaard Dykstra, University of Iowa @qu:The papers by Fretheim, Rozina and Vasko are to be commended for their excellent readability and clear exposition. Read this review at http://linguistlist.org/issues/13/13-1732.htmlhttp://linguistlist.org/issues/13/13-1732.html @source: @from:Patricia Donaher, Missouri Western State College @qu:I was most appreciative of the straight forward language and clear approach employed by of most of the authors. I was impressed by the depth of the articles, even the shorter ones. Each entry provides the researcher with virtually all the necessary background information on the topic and appropriate references for further information. Many of the longer entries include a thorough summary of the current research on the topic as well, and some entries provide helpful sections on where future research could or should go.